The typical office provides lots of opportunities for going green. 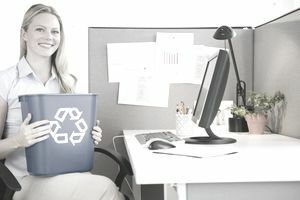 From adjusting your office's lighting system through the types of office supplies you choose and use, there are hundreds of things you can do to make your office more environmentally friendly. This guide presents a selection of going green tips for the office that are easy to implement and will make a considerable difference over time. Place a recycling center in a prominent location in your office. If a complete set of recycling containers would take too much room, put a waste paper recycling box near the printers and a general recycling box in the staff room. Empty the recycling boxes regularly and organize bottle/can returns. Encourage staff to use "real" mugs, glasses, dishes and cutlery rather than disposables. It takes just seconds to wash a mug. Use coffee filters that are made of recycled paper or even better, get a coffee maker that doesn't require paper filters. Compost coffee grounds if possible. Make sure your office has at least one large real plant in it. They're not only green and pretty but great for recycling the air. Make sure that your office is being cleaned using green products that are not damaging to the environment. Try to go "paperless" by only printing documents if necessary. There's no reason that inter-office communications can't be done electronically. Get in the habit of asking customers if they want their receipts rather than just automatically printing them. Use mobile devices or overhead projectors to display meeting agendas rather than printing and distributing them. Find a place to recycle used recyclable batteries and cell phones near you and use it. Practice green procurement (sourcing and purchasing the least environmentally damaging goods). Look for and purchase green products such as staple-less staplers and pens that can be refilled repeatedly rather than sent to a landfill. Look for and purchase products that are made from post-consumer content (materials have been collected back from previous products and remade into new ones) such as paper and plastic products. Paper clips, staplers and even UPS systems made with post-consumer content are now available, for instance. Cut down or eliminate your use of products that there are no green alternatives for, such as rubber bands. Recycle used office supplies whenever possible. Purchase and use a multifunction printer rather than separate machines for different functions if you need to be able to copy, scan and/or fax as well as print. Be sure the printer you purchase has duplexing (the ability to print on both sides of a piece of paper) and eco/energy saving features. Save paper by not printing whenever possible. Put a prominent sign up in the office to remind users to print only when necessary. Use your printer's eco-mode if it has one. Ink/toner-saving modes are fine for drafts and other printed material that doesn't require high-quality output. Refill you used ink and toner cartridges if possible, otherwise recycle them. Keep computer equipment updated; current new computers and monitors are more energy efficient than those more than a few years old. When replacing computer equipment, donate the old equipment to a charity or non-profit if possible. If not, take it to an electronics recycling facility. See Where to Recycle Computers in Canada and Computer Recycling in the U.S. Turn the lights off in rooms when they're not in use. For instance, there's no point in having the lights in an office staff room or washroom on all day. Replace standard incandescent bulbs with compact fluorescent lamps (CFLs) or LED bulbs wherever possible. These use 75 percent less energy than standard incandescent light bulbs while delivering the same light output. Use light wall colors; light paint colours and higher gloss sheens reflect daylight, meaning your space will need less overhead lighting. BC Hydro has an excellent guide for making the most of natural light to light your office space. If you have access to your office thermostat, heat your office to a maximum of 70°F/21°C when occupied, 61°F/16°C when unoccupied. Heating and cooling set points should be set a few degrees apart so that the air conditioner does not cycle (turn on and off) frequently. Make sure your furnace/heat pump/air conditioning systems are serviced regularly and working properly. Use weather-stripping and caulking to minimize heat loss from windows and doors. Always turn off taps completely, ensuring that they don't drip. A tap, leaking at a rate of only one drop per second, can waste more than 25 litres of water a day – that's about 10 000 litres a year (Environment Canada). Install low-flow faucet aerators to reduce the flow of water from taps. Even better, install motion sensor faucets. Get continually running toilets fixed. They're huge water wasters and it could be just a simple fix. Make sure all washroom cleaning products are eco-friendly.